Thread: How do you carry your flashlight? I'm looking for a way to EDC a flashlight and I'm trying to figure out a way to incorporate it. 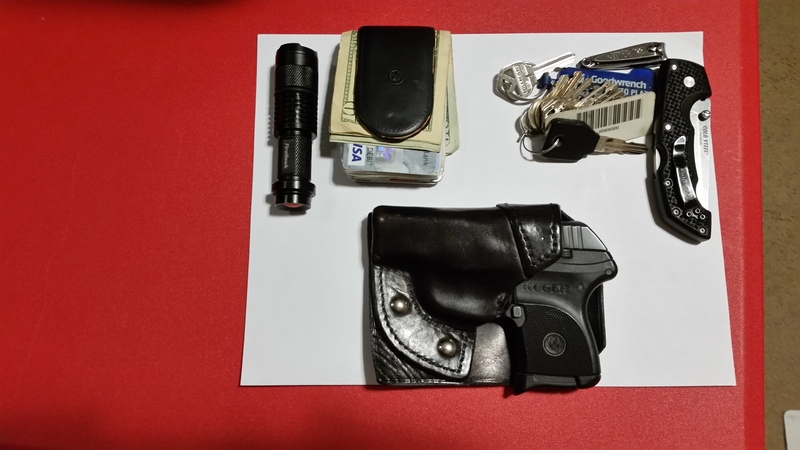 Here is my current EDC layout. Both back pockets: empty and I'd like to keep them that way to prevent hip problems. The only practical way I can think is to get a custom holster for 1 mag and the flashlight. I'm also considering getting some "tactical" or "EDC" pants from someone like 5.11 and using one of the extra pockets for the flashlight. How do you carry a flashlight? Any other suggestions? I carry the Surefire Tactician light which has an extremely stout pocket clip. Outstanding light and the only one I have ever carried that I believe the clip will never break or deform. I am right handed and carry the Tactician in the left rear slash pocket of my 5.11 Taclite Pro pants. I don't ever know that it is there. I've owned quite a few different lights - mostly Surefires - and this one is the best light I have ever owned. TSKnight and Old Man like this. I used to have a zip tie on a belt loop for that. But that was when I was using 3 cell mag lite. Now, I stick it in my left front pocket. Left front pocket for me. I'm right handed. TSKnight and bill35738 like this. Right leg pocket of my Carhartt's. TSKnight and Primalgunner like this. I don’t carry one on me. Have a couple in the truck that are at hand reach and several through out home including one on night stand. Just don’t have enough pockets in a pair of jeans for everything. Pouch on off side of belt...use it all day long...appx 345 lumens. AzQkr and TSKnight like this. Left pocket. In 2 pocket pouch the other pocket has spare mag. I keep mine in my console. I carry a Streamlight Stinger as my primary light. It stays in a "belt light loop" on my belt. 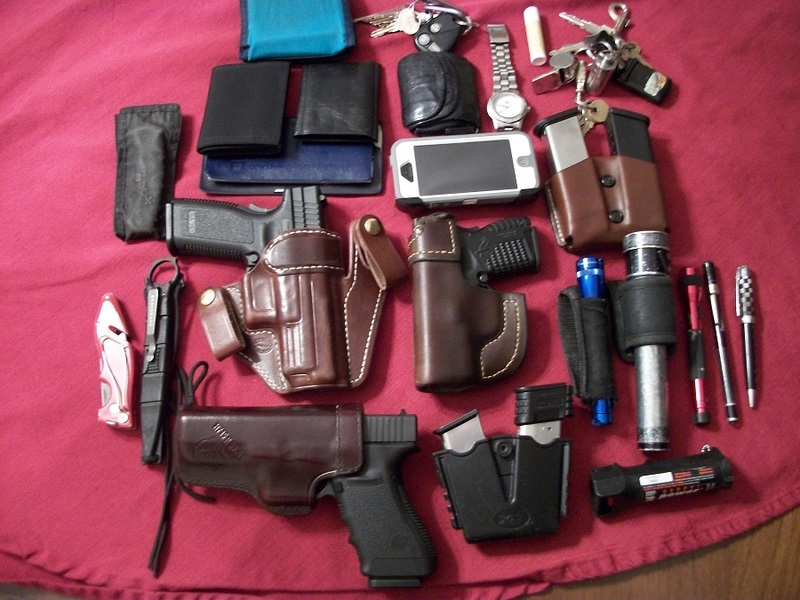 Older pocket dump pictured. AzQkr, G26Raven and TSKnight like this. Fenix PD 32 in my rt. front jeans pocket. I don't leave home without it. Usually there is a spare magazine stuck on the magnet of the money clip, but the jeans I wore today have small front pockets. The flashlight is an inexpensive 120 lumin LED. Click on and off with an adjustable beam. Bought 5 of them for $10. I carry one, my brother carries one and there is one on both 4 wheelers. Kept one as a spare, but haven't needed it yet. I have much better lights available, but none that are as convenient to carry every day all day. This one is two years old and has been used and abused every day. Runs on a single AA battery with about a 10 hour run time. AzQkr and Old Man like this. Left front pocket. I have several different ones depending on what I’m doing. Please tell me you don't carry all of that at once.